Our waxing service caters to women who love the feeling of freshly waxed skin, but who also demand professionalism, a clean working environment, respect for their modesty and a thorough, unhurried treatment. Love your Brazilians, but can’t stand the pain? At the Total Body Clinic in Wayne, we’re sympathetic to clients who love the feeling of freshly waxed skin, but get anxious about the discomfort they might endure during their treatment. Whether doing a Brazilian wax, bikini wax, leg wax or a simple upper lip wax, our estheticians apply years of experience, a skillful technique and a reassuring touch to every treatment. They will also teach you some breathing techniques to help keep you and your skin relaxed. We are well-aware of the common complaints of women who regularly wax their bikini areas. Rest assured that we have thought long and hard on how to provide our clients with the best waxing service possible! We don’t rush you, we remove all stragglers and ingrown, use stripless wax to reduce pain, and respect your dignity by providing you with disposable underwear and privacy to change in an out of your clothes. We never double-dip our wax sticks, we always wear gloves, we change the paper on our tables after every client, and we keep our tweezers and other instruments permanently sterilized. Check out our blog post on waxing and wax center establishments for more details. Many of the troubles caused by waxing can be avoided by being proactive. If ingrown hair is a problem for you after having been waxed, you should consider a pre-treatment exfoliation. For best waxing results, keep your skin hydrated and moisturized as a general rule. You should also avoid waxing skin that has been recently sunburned. To keep pain to a minimum, wait a week after menstruating to have your wax, and avoid caffeine for 24 hours prior to your session. Your ability to relax during the treatment is also important; please arrive a few minutes early to enjoy an unrushed treatment and the best wax experience imaginable. This will give you time to read and sign our waxing release form. You can download the form and hand It in when you arrive. 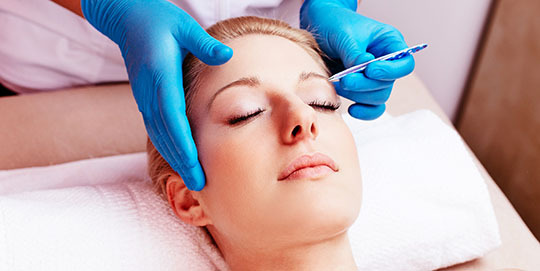 Absolute contraindications: You must avoid waxing if you are using Retin-A, Renova, or other medicines that use RetinA, or if you have recently had a peeling. Those using blood thinners should also avoid waxing. Our esthetics team is trained and supervised by lead esthetician Isabel Viveros-Ciampi, who has performed Brazilian waxing, bikini waxing, leg waxing and eyebrow styling for over 10 years. Isabel is also a trained eyebrow shaping specialist, having studied makeup artistry in 1990s. In 2005, she perfected her eyebrow-design skills under the famed Hollywood makeup guru Marvin Westmore. We are trained expert eyebrow shapers, and will take the time to tweeze and wax so that your brows once again match each other, while framing your eyes and complementing your face. If you’ve tried shaping your eyebrows yourself and now wish you hadn’t, stop in and have us put you back on track! Our skills in this area are usually the icing on the cake for brides-to-be seeking a brow artist to help them look their best on their big day. Plan on spending 30-45 minutes for your initial treatment and 15-20 minutes for maintenance sessions. Removes the hair outside the bikini line. Those who wax regularly can expect to pay at the low end while first-timers and infrequent waxers will pay more based on additional time required. Takes all hair off the in the front (except perhaps a small strip) and continues down right before the back. It doesn’t take hair off from the back like a Brazilian. Those who wax regularly can expect to pay at the low end while first-timers and infrequent waxers will pay more based on additional time required. Takes all hair off the bikini line, the full front all the way to the backside (yes, between your cheeks). Sometimes a small landing strip or triangle is left in the front. Those who wax regularly can expect to pay at the low end while first-timers and infrequent waxers will pay more based on additional time required.